God calls all men to the fullness of life, by sharing in the salvation that he has merited for us by his Cross and Resurrection. And he calls some to leave everything in order to follow him, in the same way as the apostles. The vocation to the priesthood is first of all a loving call by the Lord; God sows in certain hearts a desire to be totally dedicated to Him in order to announce the Salvation to mankind. In a concrete life, this call is often manifested in a discrete manner, which it is necessary to know how to notice. It passes in particular by three things: the desire, the experience and the aptitudes. A deep desire to unite oneself to Christ, to evangelize and to serve God with an undivided heart; the experience of a particular joy obtained during moments consecrated to God, in charity works or in prayer; and the personal aptitudes that one has. Through this, one may recognize that the Lord is calling us; being a priest is as well an acceptance of an invitation from God as a reply to the deepest desires of the heart. It is necessary to clarify: God calls freely whoever he wishes, and without consideration to merits. The Apostle isn’t chosen because he is better than others – the many errors of Peter, chief of the apostolic college, show it well, and he himself is conscious of it (cf. Lc 5,8). God does not choose the best, he chooses “those he wishes” (Mc 3,13). His call extends to the silence of the heart. At the same time, this call is eminently personal, which is to say that it comes to encounter that which is deepest in our person, and to reveal the best part of ourselves. 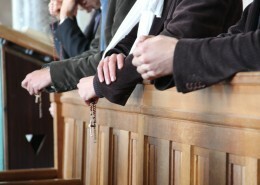 This first discernment is favoured by an intensification of the personal life as a Christian – taking time regularly for silent prayer, meditating the word of God, attending Mass more often, going to confession regularly, reading spiritual books, coming closer to the Virgin Mary by praying the rosary. Since it is good not to confuse God’s call with a personal projection, it is fitting to live this reflection while sharing it with a person which can provide with good, fully developed advice; it is the occasion to start a relation of spiritual direction – which will be fruitful no matter what. Taking a privileged time of intimacy with God is also very favourable for discerning the vocation. One can for example make a retreat or a sojourn to the calm in a monastery or a religious community. If the desire is real, and without having waited for years or received irrefutable proof that one is being called, one can contact the superior of the seminary, in order to confide to him one’s desire or even simply one’s questioning. Be confident – this is not a recruiting sergeant, and he has no interest whatsoever in that a young man who wouldn’t be at his right place should enter the seminary with him, something which would make both himself and the Community to suffer. The meeting with the superior determines therefore the following events – whether is it necessary to continue to discern, or to dive in right now. In every case, the first cycle of the seminary stays to be a cycle of discernment; one isn’t priest immediately, and the whole complete aspect of the formation dispensed here permits to consider the question of the call in a very serious manner, once entered. It is then in the Church that God’s call is discerned. For if the vocation is first felt as a personal desire in reply to a call from God, it is at the same time an “objective” call of the Church, to which the Lord has entrusted the task to continue his mission. Like Jesus, the Church, through the voice of the priests responsible for the formation, chooses “those (She) wishes” (Mc 3,13). Thus, the discernment at the seminary is double: it is that of the young man who gives himself in the intimacy of the heart, and that of the Church, particularly of the priests in charge of the formation at the seminary. 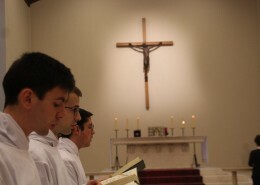 In this way, all along the formation, and more specifically during the first three years, the seminarian is called to refine his discernment and confront it at length. This is carried out in a personal manner, with the aid of the spiritual director, and through the regular encounters with the headmaster of the seminary and the general moderator. In order to be a priest of the Community of Saint Martin, it is necessary to be attracted by the life in common, and to be disposable for the mobility at the service of the Mission. The actual House of formation accommodates the young Len who wish to become a priest in the bosom of the Community. It is a privileged place for listening to the Holy Spirit in order to discern the depth of the call of God, under the watch of the Church. 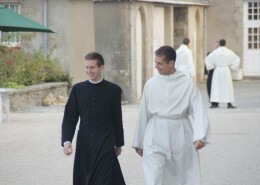 The seminarians there receives as well the human, intellectual and spiritual formation necessary to exercice the ministry of priest or deacon. In order to enter the Community of Saint Martin, it is necessary to contact the responsable for the House of formation, don Louis-Hervé Guiny. It is possible t make some sojourns before entering the seminary, in order to get to know the Community and take contact with the superiors. After six years of studies, the seminarian may be ordained a deacon. After one year often spent in a parish, he may be ordained a priest. The seminarians of the Community of Saint Martin are called to Holy Orders by the General Moderator of the Community. The fraternal life of priests, and the exercice of the ministry in common, at the example of the apostles, is a privileged means in order to exercice the priesthood and live radically in following it. 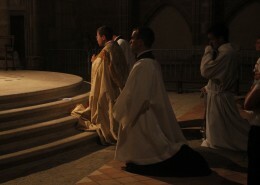 It is founded on the fact that the priests participate in the unique priesthood of Christ. It is the occasion to tender a unique charity, capable of shining over all of the parish. For these reasons, this form of life has been vividly encouraged by the Second Vatican Council and the Magisterium. Principal page of the portal "Becoming a priest"
THE STEPS OF THE PRIESTLY FORMATION Why the Community?